They each contained an inspirational quote, and Lam wished the students well: "I hope you enjoyed this class," she wrote. "All the best in your future." 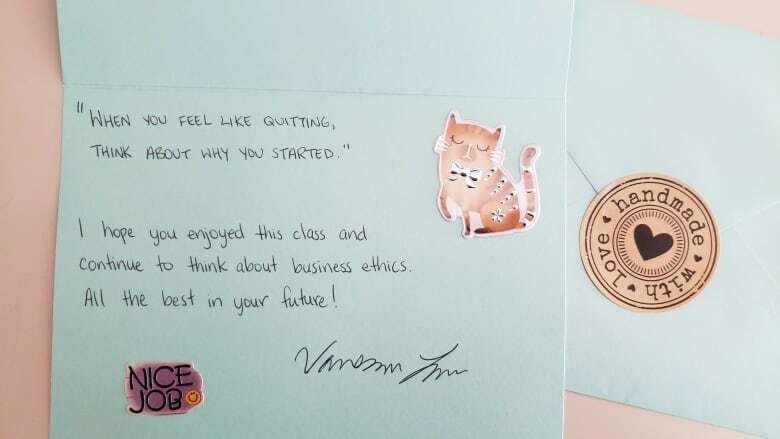 There were a couple of cute stickers, one with a cat, another that said "nice job," as well as Lam's personal contact information in case students wanted to reach out. She also included a packet of tea. "I thought, 'Oh my gosh, This is really sweet,'" she said. The quote in her card read: "When you feel like quitting, think about why you started." 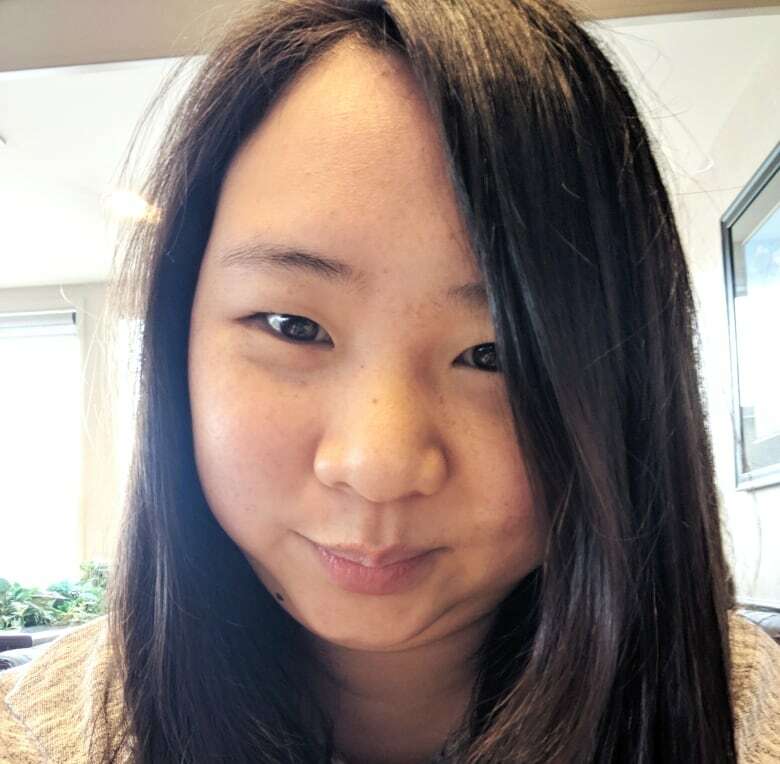 CBC is keeping the student's name confidential, as guided by its journalistic standards and practices around suicide, and the potential harm to people who come forward on mental health issues. "It got really bad at the end of March, the beginning of April. That morning, going into class was really difficult. I had a hard time kind of getting out of bed," she said. She's struggled with being away from home and with the pressure to do well in her courses. "It's a short quote, but it kind of means a lot. When you're in that state of mind, something small like that is kind of like, wow, maybe I should rethink all of this." The student anonymously posted the note on Reddit. Few people knew she had suicidal thoughts, the student told CBC. Her family knows she has depression, but she didn't tell them how bad things had become the past two months. Her family was unaware she'd thought about suicide and was still unaware when the student was interviewed by CBC. "I've been through the wringer when it comes to hospitalization and social services … I've just been through it," she said. "If part of what I do helps somebody else through that very difficult time, then I'm very happy." "I've brought that to my adult life, and I'm thinking, 'What would students really care about? Or what would make them feel like their teacher is listening?' So something like a note — it's a small gesture and it's nominally impressive, but it's something that lets you know that somebody sat down, took the time to write this for you and cares about what's going on in your life," she said. Lam has reconnected with this student and she said that reaction is why it's important for her to reach out. "As a person, we are supposed to take care of other people, and if somebody needs information that I have and that I can provide, then I'm absolutely going to do that," she said. "I don't care if I'm not paid for it. I don't care if it takes time out of my day. If it helps someone through their life, that's what's most important." The student is finishing up final projects and exams. She says she's also receiving additional mental health support. "I am in a better, healthier state of mind now than I was, like, a week ago," she says. She says she wasn't anticipating the response the Reddit post received. And she wanted to share her story in hopes it could help others who may be feeling the same way. "The state of mind I was in is something I don't wish upon my worst enemy. And the thought of someone being in a similar state of mind that I was in pains me," she said. "The letter made me realize that there is hope and maybe life has more to offer than sadness and struggles."